As technology spreads to every tiny aspect of our lives, role of engineering management is becoming more relevant in every domain and industry. Be it pharmaceutical company or an agricultural one, everyone is dealing with engineering challenges at some level – chemical, mechanical, civil, hardware electronics engineering dealing with tangible products while software and computer engineering dealing with the abstract information. Understandably, there has been a constant increase in the demand for managers who understand technology and engineering aspects alike which gave rise to programs such as MEM (MS in Engineering Management), MIS (Management Information Systems), MIM (MS in Information Management), MSIS (MS in Information Systems) and so forth. With few differences, these programs aim at combining technical depth with business breadth so that the students can understand both management and engineering language. One theme that underlines all these programs is that they are core business programs with engineering electives. The focus is still on management courses such as statistics, analytics, supply chain etc and one can pick electives in database, programming, networks etc. Remember that these programs are likely to be biased towards applicant with some work experience. MEM – Core management programs with courses in Marketing, Finance, Management, Operations, Modeling and available engineering electives (not just software but industrial engineering, nanotechnology etc). Typically, prepare candidates for consulting, business analysis in any engineering related work function. Duke’s MEM program is leading in this category. Look at their electives to get a sense of the course offering. Above chart shows how the incoming student profile is distributed. 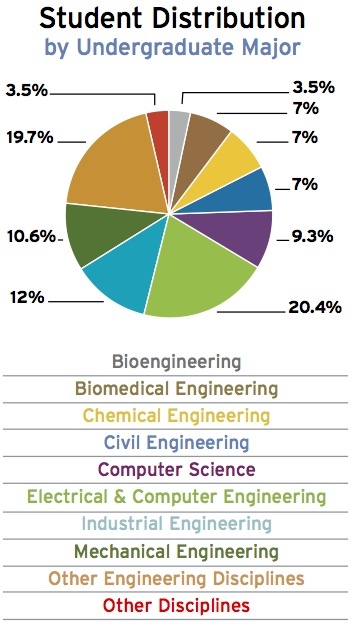 As you can see, it is widely spread among various engineering majors. MIS – More like MEM for IT, so focusing on IT electives such as data mining, AI, networking etc. One might think of it as a less competitive version of MBA specializing in IS (but then, less reputed than an MBA too). Expect roles such as system analysts, data analysts, systems engineer, database admin after this. MSIS, MIM – These are other variations of MEM and MIS programs. You will find some more such as MSTM, MSEM offered with various names in different schools. Before you decide which one to apply to, take a good look at the curriculum to ensure it suits your background and goals. I have seen a lot of engineering grads going for these courses recently and we receive lot of inquiries about this program. So check out this post on FAQ for MIS/MEM programs. Since there is a bigger demand for these courses right now, acceptance rates are fairly high. For more admission data and professional counseling help if you are applying for MIS/MEM in Fall 2014, please check our counseling packages. Thnank you for helpful articles. I am a HR manager soon moving to US after my marriage. I think I could study MIS there to get jobs? Thanks Mugdha. Whats your undergrad major? Yeah you can go for MIM I believe or MBA too but MBA applications are lot more time consuming. Thanks for the list of universities. Under what name does UPenn give this degree? I went through their website but I found Computer Science degrees that can be clubbed with a few electives from Wharton, if the professors allow. That is a valid confusion since UPenn only offers MIS for undergraduates. For graduate programs, you can look at the ones that do offer it. That list is based on college rankings for MIS. Hope that helps. I am also looking up Ivy Leagues, may be every applicant’s dream. But I didn’t find an MIS-type program there? How close are Data Sciences/Information Sciences programs to MIS? A few Ivy League websites say their courses are streamlined to pursuing careers in analytics, which is something I want to do. For eg. Columbia has a new MS in Data Sciences program beginning next year. How good is Columbia for this course, since it is better known for the other programs it offers? Okay one last doubt! 😛 I want to go specifically into Market Research. An MIS/Analytics degree is good enough for it, right? Data Sciences program are better suited for analytics and since that is your interest, you can definitely go for those. For market research, analytics degree would be more credible – the emphasis being on quants and numbers as opposed to IS (more of computer and databases related side of data). That’s just a cursory thought, would need to discuss to give more definite opinions. I’ve completed my bachelors in Information Technology, and thinking of pursuing an MS degree from US. Am confused between mem program and mis . Which one should i go for ? Is there any major difference between these two courses ? and which one is better? also what are the career paths? I know too many questions in one go 😛 , but please really need help right now. MIS is better for roles in Information Services sector whereas MEM offers courses outside IS too. Depends on your goals and background. Feel free to call us to discuss. Surely, will get in touch soon. I was wondering if doing an MBA after MEM ,MIS or any techno-management related courses would be redundant . Although these courses have a management component can they effectively replace a traditional MBA ? No, they do not replace MBA and there will be some or significant overlap at least in management courses but their reputation has still not reached that of MBA. At the same time, MIS/MEM are not as competitive as MBA, so its easier to get in and if you plan well, you can land some great jobs after these courses as well. I want to do M.S in MEM. should i go for GRE this semester or should i take Work-Ex for 1-2 yrs and then go for M.S since i don’t have a very impressive profile ( or cgpa ) ?? Yes I think some work experience would help you. Going with backlogs is probably not a good idea. Neither of them has super brand value, so it would not make much of a difference frankly in terms of career opportunities. You can go for either – both are good weatherwise anyways, so that won’t be a factor. California may have more tech companies around. I have an under graduate degree in Computer Science from an NIT with a cgpa of 7.37..1 backlog..i want to pursue my masters in a manegement course and work in the same domain, courses like MIS MIM etc as i read above arn’t at the level of MBA so what kindof a course should i take that would have more of manegerial subjects with technology as well to have a position in management during jobs or should i specialise in specific management subjects like Ms in Operations Management, Supply Chain etc to increase my chances of getting a good job? You can go for MIS. But first do a little introspection on what kind of career are you looking for later on. Can discuss that on phone. Good question. MIS will let you take core business courses where as MS CS wouldn’t. That is the prime difference. MS will be helpful if you want to continue core technical career whereas MIS will open consulting, analytical roles. I dont think MIS has limited potential…one of my students with very competitive profile chose to go for MIS even though he could have been admitted into top MS programs…so its a matter of what kind of career are you looking for. Call us if you want to discuss in detail. I just graduated in Information Technology. My aggregate percentage is 54% which is obviously less. I have total of 6 backlogs. I want to pursue masters in CS or MIS but I am not sure if I could make it to some good/average universities in US. My profile is not that impressive. What do u think I should do to get into those universities? How can I improve my profile? Do I need to work before applying to universities? What about global certifications? I know I’ve asked a lot many questions, but these questions always remain unanswered and i can’t go past it. I graduated(July 2012)in Instrumentation Engineering with 58% Aggregate marks.I have 6 months Internship Experience in Design and Enginnering Company and Currently working as Project Engineer for a Swiss Instrumentation Company from last 1.5 years and my work profile includes project mangement,schedhuling,cost control logistics.So My Total Experience is Internship+Current Exp=2 years. Im interested MEM in US for FALL 2015 ,Im going to appear for GRE & TOEFL in month of NOV . My question to you is what is minimum GRE marks required for good universities for getting in MEM . Will my less aggregate affect my admit ? can it compensated with good gre score,LOR & SOP . Can i consider DUKE university ? Also,besides DUKE which are other good universities offering MEM ? Since I will applying in month of December 2014 will be it late ??? Will my current experience be counted for Admit ? Im also considering Ms in MIS , will be it considering a non it background . If there is a valid reason for your low GPA, you should try explaining that. You should target MEM over MIS since thats what matches your background. I can’t predict for Duke but you will need a very solid application for it to compensate for your GPA. Can only discuss that on phone. I have b-tech civil engineering degree with 62% passed out in 2012 and also worked as Quantity surveyor or estimation engineer (autocad, excel, data managemet, costing softwares .. ectc) on two years in India and 9 months in Dubai. I would like to take MS on MIS. May I get F1 VISA approval ?. I’m planning of pursuing MEM. Could you give me the list of colleges that offer this course? I’m Rakshith, I have an aggregate of 69% in BE and working as Oracle DBA since 2 years. Im planning to do my masters in MIS. My GRE is 283 and im willing to take GRE again in DEC and IELTS in JAN. Could you please let me know for 283 what colleges i may get and list of colleges for the same course as im retaking GRE. Im wishing to join for Georgia tech Univ, what would be the approximate fee expenditure and cost of living there ?? Target Course – MIS / MEM confused!! I want to pursue more management driven course instead of moving for Core technical courses. Hello, what’s the difference between umcp MIS and umcp MIM? Are they very different in terms of job prospects? can u please tell me the difference between MIS , MS ITM , MS IS , MS IT are they all similar courses ?? . I want to do masters in MIS . can plaese guide me. I am a Chemical engineer with 2.5 yr of work-ex planning for MEM courses, could you please tel me the scope of mem?? and jobs after MEM?? Being a chem engg. which one is preferable MEM, MIM oe MIS?? MEM should be the one for you I believe but not all programs will have enough electives in Chemical. So, you need to check individual programs to find the ones that are relevant for what you are looking to do if you dont want to leave your chemical background altogether. Thanks for the reply. Chemical really is not the most sought out streams ( anything apart from CS or IT for that matter) in the US, I am more inclined towards masters in management degrees like masters is supply chain or masters in strategic management, can you kindly suggest a few mid to high level institutes that offer these courses?? I am Electrical Engineer with CGPA 7.4, working with Infosys from past 15 months dealing with business reports and analytics. planning to take GRE in 2015 end. Want to pursue MSIS from any one of them i.e. NYU, SUNY Buffalo, UC berkley, Texas A&M, ASU. Is there any chance of getting admit with score range 325 – 330 or do i have to increase my target score above 330 for any one of them? I did my B.Tech in Electrical Engineering with CGPA 7.4, but working in IT firm (Infosys) from past 15 months dealing with business reports and analytics. planning to take GRE in 2015 end. Want to pursue MSIS from any one of them i.e. NYU, SUNY Buffalo, UC berkley, Texas A&M, ASU. Is there any chance of getting admit with score range 325 – 330 or do i have to increase my target score above 330 for any one of them? Hi Nistha, can you suggest me whether to go for MEM or MIS. I have done my undergrads in Electronics and communication engineering and working in Deloitte as an Technical consultant for past 1.5 yrs. My grads say 9.03/10.00. Please suggest which course to follow? confused between MS IN IS & MS IN EM . INSTRUMENTATION ENGG – 53% GRE-302 , TOEFL -85 .3+ YEARS OF EXP IN OIL INDUSTRY BUT DOES MEM GUYS GET JOBS AS PPL WITH IS MAJORS ATLEAST GET SOME JOBS .NEED HELP. I have done B.tech in ChemE (7.21 gpa,no backlogs) , I have work experience as an Associate System Engineer at IBM for 1 year now. My GRE is 309 and Toefl 97, I’m interested in Analytics area and I would like to pursue MIS in USA. Currently I am taking courses in R and Python. Is it okay for me to take MIS being from a different stream? I have completed my engineering in 2012 from Pune University. I have 3 years of work experience in Software Testing. I wish to do MS in MIS. I will be taking my GRE this year. Would you please tell me some universities and courses which offer lesser amount of coding involved..? Can you please guide me? I have completed my BE in ECE and am working in a reputed IT firm now. I have always wanted to go for a management course and I prefer a MEM or a MIS. Now it is ok to go for MIS with a under grad in ECE ? Is there something called MEM with computer science? I am in dilemma to choose mis /Cs .. But many people wil tel mis requires more work experience .. I wil have 1 year experience in database team . at the time of fall 2016 so what u suggest wil I get admit in univ and job ?? I have done by BE in Electronics and Communication Engineering with CGPA of 9.03 and i am working in Deloitte consulting for past 1.5 Years as Technology Analyst. Can you please suggest me whether MEM is better or MIS. I got score of 315 in GRE and TOEFL yet to be give. Please suggest Universities in US for the same.. 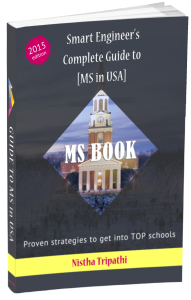 KUDOS to you.Really you are doing a great job by helping many applicants who dream of studying in the US.I am a 2016 fall MIS applicant.Completed my BE from SRM UNIVERSITY Chennai in ECE.My profile is BE-7.6 ,GRE -305(q-159,v146,awa-3) taking up IELTS on 19th sept.Will be having a work-exp of 18 months till next fall in TCS.Have got decent extra curricular(have won many State and National level singing competition in college as well as school),lead vocalist of a professional band,organised many musical and other events in college,was Convenor of a club in college,have been an active member of NGO and NSS etc.I will try to write a decent SOP and can get good recommendations .I would request you to help me in shortlisting colleges suitable for my profile.Thanks in advance. I completed my Btech. in CSE with 77% and having an experience of 2.1 years in famous MNC in India, 10th- and 12th- 85%. I am having profile of java development, worked in development for past 2 years. I want to pursue MS in MIS, will be appearing for GRE next month. Is my profile apt for MIS? I will need more details to comment substantially but yes, you can go for MIS. I want to know being in java development domain and from CS background, Apart from good GRE score. will my profile be selected by good universities? Could you please suggest universities for my profile? I am planning to apply for MIS/MEM. Hi I got 298 in gre and I have 2yr of work ex and my GPA is 8.47.I want to apply for MIS for Fall 2016.Please suggest me colleges according to my profile. I have completed my masters in computer science and i wish to study more. I’m confused between mim and mis. i do not like programming and wish to do something on the management side. Could you please suggest the better of the two? I did my engineering in computers in 2015. And I am confused with the degrees MIS or MEM . plz let me know in terms of job perspective because I am interested more in the management side but I don’t know what kind of specific jobs are available. I am an Electrical Engineer. I want to pursue Engineering Management. What is the career after doing this course. Also I have a experience of 2+ in a manufacturing industry. i am yet to give GRE and IELTS. Plz help me suggesting some good universities. I wished to know regarding the Masters in Management program that is being offered by many universities and by the Kellog School of Business as well.Is it a good program and does it have scope like an MBA? I’m a student of btech, cse third year. I am literally very confused what should I do now, whether I should go for a job after btech or do higher studies. I’m in a dilemma. Can you please guide me regarding this issue. It’ll be highly appreciable. Hi , According to you is UIUC MSTM (1 year , expensive fee)program more valued when compared to UTD MSTM program. The course is different but your opinion will be great. Would like to know your views. Any higher ranked university which can be applied with reasonably good chances ? Hii, my gre score is 300. Is is possible that i could northeastern ??? but i am not able to decide between these two. Hi. Thanks for sharing the information. I want your suggestion for something. I have done B.tech in ECE and Mba in marketing from India and i am working in Sales job based on my mba campus recruitment. Now i want to further study MS in usa. Which course do you think i should choose? MS in Cs or MIS or MEM?? I have interest in computer related subjects but i have never done programming as a core subject. Hello How can I know which universities include MIS in STEM Course.I searched many sites but that does not give clear idea about the university which include mis in stem. Please help me out. Hi. I am a Structural Engineer with 5 years experience. Will MIS be suitable for my career? I am BE mechanical engineering graduate and with two years of experience in the Field of HVAC.Can i do a MS in MEM in US? does it require a work experience in the management field to get admission in US? Scholar Strategy is for people who are looking for a mentor and not a typical counselor. Working with Nistha has been great. She helps you come up with a unique story of your own for the SOP and this I believe is one thing that makes your application stand out. She was available on mails throughout the process, giving honest and practical suggestions. A special mention to our closed Facebook group called ‘Scholar Strategy gang’, this group’s peer-help has been amazing. Thank you, Nistha! Working with Nistha was a great experience as she meticulously helped me form a strategy for the SoP . Throughout the application period , there were numerous discussions and iterations , the final version of SoP looked much better than I had envisaged . I don’t think the admits would have been possible without her guidance. Thanks Nistha ! Nistha was really helpful and guided me through out my application process. Right from university shortlisting to writing SOPs and LORs, her guidance was very useful. Her reviews and comments were straight-forward and meaningful. She was very approachable and was always available for assistance. Overall I would like to thank Nistha for her counseling throughout my application process and would recommend her to all my friends. see Divya’s blog on her late application here. Once again thanks for helping me improve my SOP. Your comments really played a major role! Thank you so much for your help during the initial phase of the journey. It helped a lot in the way I explore and articulate about myself. It is definitely going to help me for internships and jobs in future for sure.